Microsoft this week activated beta accounts for a select number users interested in testing out the iOS version of its Cortana personal assistant, the software giant's alternative to Siri and Google Now. 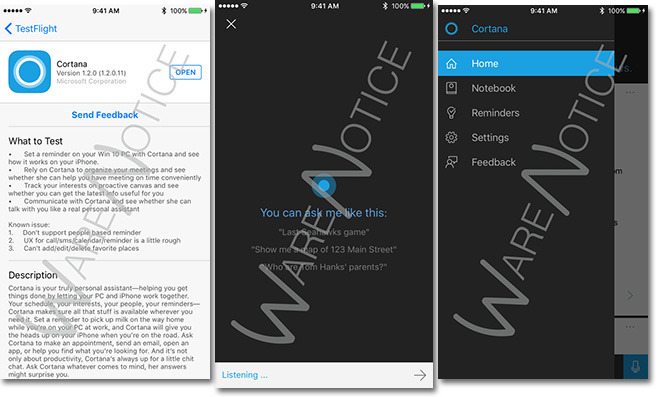 First spotted by WareNotice, Microsoft's Cortana TestFlight invitations are going out to iOS device owners who signed up for the beta in early November. Microsoft is notably using TestFlight for initial testing purposes, which means the initial Cortana beta pool is relatively small at Apple's 2,000 user cap. As expected, Cortana on iOS lets users create reminders, schedule appointments, perform Internet queries, compose emails and messages, track packages and more via voice interactions. Like Apple's Siri, Cortana is programmed to accept natural language input and the TestFlight notes urge users to "see whether she can talk with you like a real personal assistant." Microsoft is positioning Cortana as more than a virtual assistant, however. The company touts the service as a cross-platform tool for people who might use PC at the office and an iOS device at home. For example, setting a location-based reminder on Cortana for Windows will push that event to Cortana for iOS, which uses iPhone's geolocation assets to trigger an alert. Cortana also offers proactive suggestions, a feature pioneered with Google Now and most recently added to Siri running on iOS 9. Like most virtual assistants on the market, Microsoft's version can track packages, check flight times, sports scores and stocks, find movie times and perform other pull in other information from relevant online services. Microsoft has not yet announced an expected release date, though the company is concurrently beta testing Cortana on Android, suggesting the cross-platform project is wide-ranging.